The two-channel model HPSC2 has been developed to capture fast moving objects with maximized picture sharpness, in applications where speed, asynchrony and flexibility is mandatory. 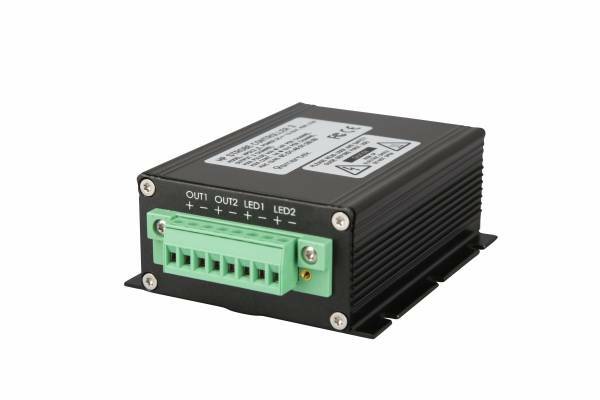 Driving a broad range of LED illuminations, it comes with a digital regulated buck and boost switching power supply with up to 120W on output and an unbeaten pulse energy. The two individually controllable input and output channels enable an asynchronous operation at up to 50kHz and full control over light intensity, timing, synchronization and overdriving of one or two light heads in different lighting scenarios via one single strobe controller. With its very high signal quality and stability it produces up to 40A pulses at a maximum of 48V on the output. A cutting-edge hardware design in a compact rugged housing, combined with Optimal Autosense for ideal operating conditions at any time, achieves an efficiency well in excess of 90%. For precise synchronization and strong overdrive options the HPSC2 comes with opto-isolated trigger inputs and separate output lines for external synchronization.